Superdry men’s military parka jacket. 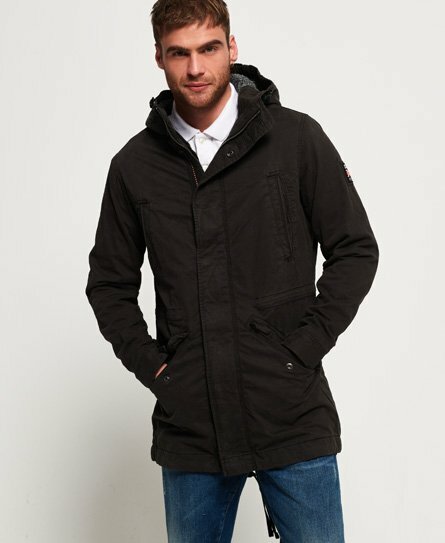 A military inspired parka jacket featuring a zip and popper front fastening, a toggle adjustable hood and four front pockets. The military parka jacket also features popper fastened cuffs, and a toggle adjustable hem in a fishtail design. For extra warmth, the military parka jacket has a fleece lined upper body and hood. This jacket is finished with a Superdry logo tab on one of the pockets and a Superdry International logo patch on the sleeve. Layer this jacket over your favourite hoodie for a stylish everyday look.